In the map you will find the conference venue (Le Meridien Grand Hotel), the hotels with the SISPAD block reservations, as well as the locations for the conference reception and the conference dinner. Albrecht Dürer Aiport Nürnberg is located close to the city with direct subway connection (12 min, subway line U2) to Nuremberg central train station. The conference hotel (Le Meridien Grand Hotel) is a 3 min walk away from Nuremberg central train station. The airport has optimum connections to the intercontinental flight network through the proximity of international airports (Frankfurt am Main, Munich, Amsterdam, Paris, Zurich). Furthermore, there are train connections to Nuremberg from Frankfurt airport (2.5 h) and Munich airport via Munich central station (2 h), as well as a bus shuttle service from Munich airport (2 h, reservation required). Nuremberg is a junction on the European high-speed rail network with ICE and EC / IC services at hourly intervals. 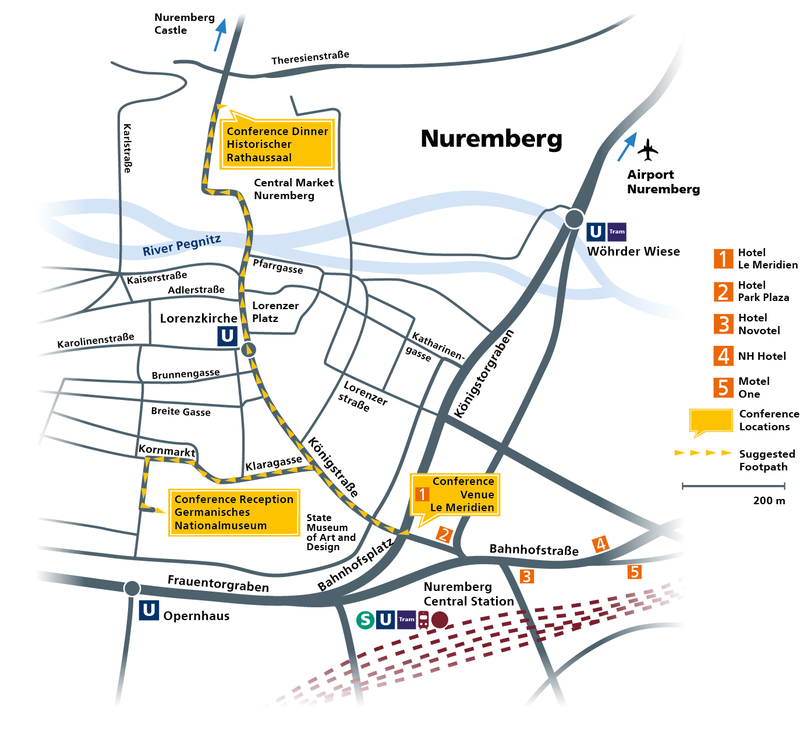 The conference hotel is a 3 min walk away from Nuremberg central train station. Good train connections allow you (within approximately 1 hour) to go to several other touristic sites, such as Bamberg (Unesco World Cultural Heritage), Munich, Würzburg, Regensburg (Unesco World Cultural Heritage), or Rothenburg. Nuremberg is directly connectedto the freeway. Europe’s leading traffic and parking guidance system ensures stress-free travel.